After taking a “Music Through the Ages” class on Onegin with Clayton Scott last summer, I knew I’d be kicking myself if I didn’t see one of the National Ballet’s only eight performances of the ballet this June. Onegin is an extremely rarely performed piece, licensed to only a handful of companies around the world and a beloved part of the NBC’s repertoire. Based on a Pushkin poem, the ballet (not to be confused with the opera of the same name and composer) is formed from various Tchaikovsky compositions. Choreographed by John Cranko, it is a remarkable, narratively driven work more beautiful than I can possibly describe. First of all, what sets Cranko’s work apart is his sense of story. Unlike many ballets, in which the action is interrupted often and for quite some time while various soloists dance some very impressive choreography completely unrelated to the narrative, every step of Onegin is driven by plot and character. The gorgeously complex choreography tells the story and reveals the joy, impatience, frustration and heartbreak of the characters through movement. Brilliantly paced, musically connected, remarkably technical and achingly emotional, Cranko’s choreography makes ballet the only medium through which I could possibly imagine the beautiful story of Onegin ever being perfectly captured. That beautiful story is of Eugene Onegin, a bored aristocrat who comes with his friend Lensky to see what the country has to offer since the city has proven so dull. Lensky’s fiancee Olga and her mother Madame Larina are in excited preparation for her elder sister Tatiana’s birthday party, but Tatiana is more interested in her romance novels. Upon seeing Onegin, Tatiana falls in love and imagines her life with him. She writes him a letter and the next day at her birthday party, Onegin tears the letter and throws it in her face. Bored once again, he begins to flirt with Olga. Infuriated, Lensky challenges Onegin to a duel and is killed by his friend. Years later, Onegin, deepened by his guilt, is invited to a party at the palace of Prince Gremin only to find that Tatiana has grown into a beautiful and sophisticated woman and married the prince. Regretting his past behaviour, Onegin writes Tatiana a letter professing his love. And the end, well, the end is the best part, inspiring whooping applause from the audience and not to be spoiled by a review. The whole thing is heartbreakingly beautiful. But when danced by the cast that I saw, Onegin is simply indescribable. If you are unfamiliar with Canadian ballet, you may not have heard the name Rex Harrington, that is truly a shame. Harrington was a dance superstar, a charismatic virtuoso who’s moving performances of Onegin, his trademark role, have become iconic. After retiring from the NBC in 2004, Harrington injured his Achilles tendon on opening night of Lloyd Webber’s musical Song & Dance in 2006 and hasn’t really danced since. But on June 19th, as I waited for Harrington to do the “Ballet Talk” introduction I’d come to the Four Seasons Centre early to hear, a young ballerina named Jillian Vanstone approached the mic and said “I know the usher at the door told you Rex Harrington would be doing this talk. But you’ve got me instead. Rex is performing tonight”. I stared at her for a moment, unsure if I’d heard her correctly. Obviously, the 48-year-old retired dancer was not reprising his iconic performances as Onegin. But he wasn’t doing a cameo as a character actor either. He was going to dance Prince Gremin, a less demanding role that requires mature partnering skills. That night, for one performance only, Rex Harrington danced again. It was magnificent to see Harrington, received with warm applause by an audience who had sincerely missed him and dancing a part that saw Canadian ballet’s biggest star sweetly supporting his partner as she held the spotlight. If nothing more, Harrington’s single-performance role as Prince Gremin made the night I saw Onegin a one-of-a-kind experience in which the NBC’s rich past co-mingled with it’s extraordinary present and future. That present and future are defined by the spectacular performers I saw in the other roles. The NBC’s prima ballerina name-to-know du jour is Heather Ogden. She was Carmen when I saw Carmen, Aurora when I saw Sleeping Beauty, the young and vibrant star of the company. When Ogden dances you’d swear no one’s ever danced before or ever will after. At 5 foot 7 inches, Ogden’s extensions seem to, well, extend, far beyond the limits of human ability. And with partner Guillaume Cote, who is equally talented and renowned, the star really flies. (The two also make the cutest onstage and offstage couple I’ve ever encountered. They’re engaged to be married this month!). But what is truly remarkable is that the bench depth at the NBC is so impressive that the night I saw Onegin (the first evening performance, with the premiere cast in place) Ogden and Cote danced the supporting roles of Olga and Lensky. Beautiful roles unto themselves, Olga and Lenksy are nothing to sneer at both technically and dramatically. In fact, Cote’s Act II solo as Lensky prepares to duel with his friend was one of the most moving pieces of the memorable production. But for the couple (who would play the lead roles on June 20th and 24th), the extraordinary parts of Olga and Lensky were a warmup. 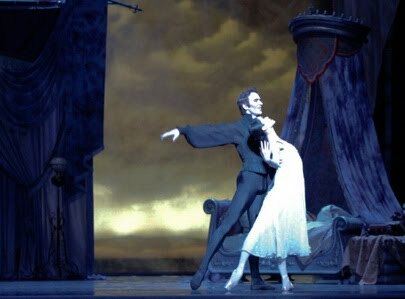 With the supporting cast populated by superstars (both iconic and current), the lead roles of Tatiana and Onegin belonged to dancers who defy description. NBC veteran Xiao Nan Yu (now in her 9th season as a principal dancer) was joined by Czech import Jiri Jelinek, who was brought in specially to dance the titular role after great success around the world. They were, um…just, a…oh, I don’t know. Brilliant. They were brilliant. That is literally all I can think to say. I have never seen anything as beautiful as these two dancers together in these roles. The National Ballet of Canada’s 2010 production of Onegin has redefined the ballet experience for me with it’s new design by Santo Loquasto, beautiful Tchaikovsky arrangements, spectacular narrative choreography by John Cranko and dream cast including Jiri Jelinek, Xiao Nan Yu, Heather Ogden, Guillaume Cote and Rex Harrington. I have never seen nor am likely to ever see anything like it and am not the least bit ashamed to say it moved me to tears more than once. A video that does little to capture the vitality of the production as seen from the second row but at least demonstrates the virtuosity of this extraordinary cast and the beauty of Cranko’s work can be found here.